Monday night’s matchup against N.J.I.T. was a tale of two halves for the Golden Eagles. The first half was a continuance of the struggles that were made evident by the stunning defeat handed to them by Nebraska-Omaha. No boxing out, missed open shots, and sieve-like defense lead to losing at halftime to a team that only a few years ago had a 52 game losing streak. The second half looked like what fans should be able to expect from the Golden Eagles going forward. The defense slowed the game down, forced turnovers, shut down top Highlander (there can only be one) Damon Lynn, and the offense put up a respectable 34 points, led by D Wilson the younger. A five point win against D1’s only conference-less team is not quite confidence building but Marquette should be able to take some of that momentum from Monday’s second half matchup into their Orlando Classic first round matchup with the Yellow Jackets of Georgia Tech. The Game Plan: They grow them tall down in Atlanta. 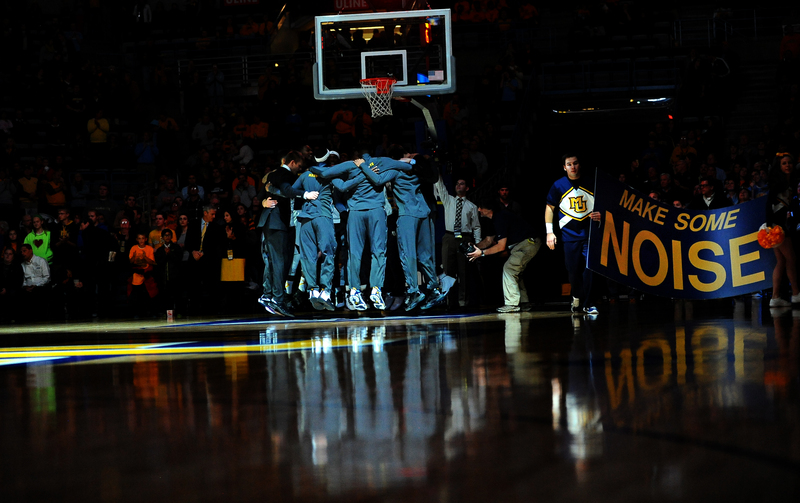 Marquette faces a starting lineup that features three players taller than their makeshift center, Steve Taylor. Not only are they tall, they are wide. Georgia Tech starts Maryland transfer Charles Mitchell and Ole Miss transfer Demarco Cox, two below the basket bigs who love using their size to clear out space under the basket. The Rambling Wreck also start Quinton Stephens, a 6-9 sharpshooter, think Ethan Wragge but a little better from two and a little worse from three. Georgia Tech gets most of it scoring from the forward position. The guards feature South Florida transfer Josh Heath, a pass first PG and Marcus-Georges Hunt, a slashing guard who led the team in scoring a season ago. In order to score, Marquette has to make open shots and draw fouls. Georgia Tech’s bigs are not very mobile and could be susceptible to easy fouls on drives from the guards. Foul trouble would force the Yellow Jackets to utilize their much shorter bench and give Marquette a prayer of not being outrebounded by double digits. On defense, Marquette must deny the entry pass as much as possible. There is no way to sugarcoat it, Talyor and Anderson will get eaten alive in the post. They simply don’t have the size or skill to contain Georgia Tech’s massive bigs. Fortunately for Marquette, Tech doesn’t have the ability to stretch the defense. They only have 15 threes on the year and 8 of those have come from Quinton Stephens, and 6 of those 8 came in his first game against Georgia. They can’t give them the full Derrick Wilson sag treatment, but when the ball gets in the post, Marquette’s guards must collapse the post. After facing the lightening quick offenses of UN-O and NJIT, Marquette will be able to play at a much more comfortable speed. Georgia Tech is sub 200 in adjusted tempo and the importance of that cannot be underestimated. Best Case: Georgia Tech cannot get the ball in the post without three Golden Eagles swarming them. Charles Mitchell (who has averaged 3.3 turnovers per game) coughs up the ball 6 times. Swarming the post leaves Heath and Georges-Hunt (combine three 3Ps on the season) open for shots, that don’t fall. On offense, Carlino, JJJ, and Duane hit their threes. Georgia Tech stretches their defense and that allows Deonte, Juan, and Steve a lot of room to attack. Marquette ends up drawing 20+ fouls. Marquette wins by 13. Worst Nightmare: Cox and Mitchell eat the tiny Marquette posts as a late night snack. Both players end up with double doubles. Quinton Stephens repeats his performance from the Georgia game and goes 5-7 from three. Tadric Jackson hits his first three pointer (0-11 on the season). Taylor gets into early foul trouble, meaning the Tech ends up with more offensive rebounds than Marquette’s defensive rebounds. Marquette ends up losing by 15+. Final Predication: Call it homerism but I like the matchup. Marquette 68 Georgia Tech 65.